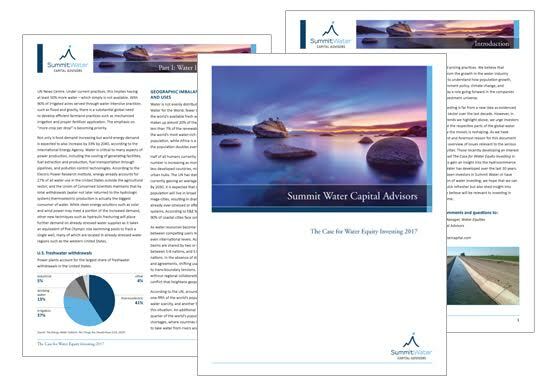 Summit Water Capital Advisors has an unrivaled, 30-year focus on investment strategies into the global water industry. Our unique proprietary methods for investing in water-related equities, physical water assets, and water infrastructure have included several private investment partnerships, public funds, and managed accounts. Demand for clean water has exploded as the strains of population increase, emerging economies, pollution, and drought have created crisis-level shortages for this most basic and necessary resource. The global market for water products and services (“hydrocommerce”) already exceeds $500 billion per year, and various industry surveys indicate that global water infrastructure spending requirements could reach a total of $12 trillion over the next 20 years. While the challenges certainly will be immense, equally as great are the long-term prospects for the industry that will meet the growing challenges – as well as the opportunities for investors with the foresight and patience to position themselves ahead of this compelling trend.